Solicitors: Why don't we appear in Google Maps? 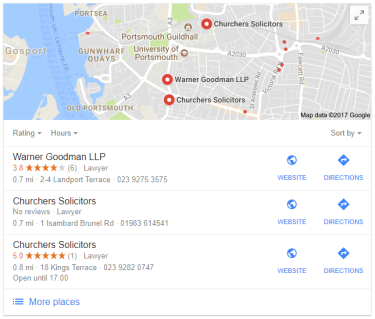 Home » Blog » Solicitors: Why don’t we appear in Google Maps? Local SEO helps you narrow down on a more targeted audience, cuts your competition and slashes the cost of your keywords. It also brings the opportunity to rank at the top of the page – in Google Maps – for keywords you might not otherwise rank for. There are two key things Google wants to know before it shows a local business in the maps feed. First, if you’re a legitimate law firm and, second, that you’re relevant to the searcher’s query. This means having your business information in three key areas: Google My Business, your website and relevant third-party sites. These are the three areas we’ll be focusing on today. The key to appearing in Google Maps for local searches is your Google My Business account. This is where the search engine gets all of its info about your business from and it likes to see a full profile. Google wants to show information to users that helps them to engage with your listing – eg: business hours, which could prompt people to call your solicitors or pay a visit before closing time. Google prioritises listings that provide this kind of information so be sure to fill out your business listing in full. Accuracy is also important with your Google My Business (GMB) account. For example, if your firm specialises in personal injury cases, you might want to choose Personal Injury Attorney as your primary category. 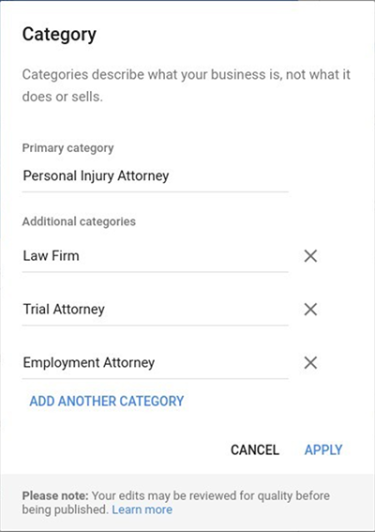 You can add up to ten categories in total to help Google match your law firm to local searches. Simply click Add another category and then Apply once you’re done. Next up, you want to provide as much additional info about your business as possible. We mentioned opening times earlier and it’s important you fill these out accurately. Even if you take calls 24/7, Google wants to know the hours people can physically walk through your doors and speak to someone. Then we have those all-important phone numbers. 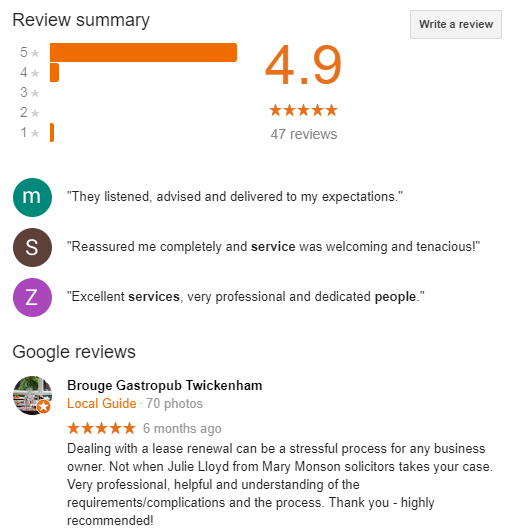 This is straightforward if you’re only operating in one location but many solicitors have multiple branches/offices which need to be listed in Google Maps. If this is the case, use local numbers for each location, rather than your head office or a national number. Finally, we should talk about images. As solicitors, the aim is to reassure people that you’re a trustworthy, professional business. Show the outside of your office with your sign in the shot. For interior shots, try to create a welcoming feel – eg: a client being handed a cup of tea as they sit down to talk with one of your lawyers. These images are often the first impression people get of your firm from Google Maps. Make them count. There’s a lot more to optimising your site for Google Maps and local SEO, in general, than you might expect. 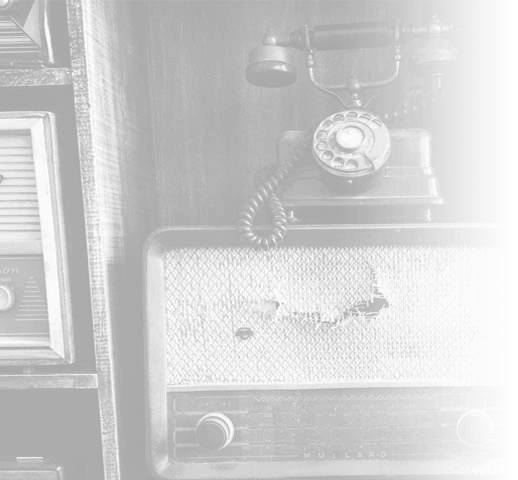 The first thing you need is to make sure you have a dedicated contact page with the exact same address and other contact info as it appears on your GMB account. This is one of the verification checks Google runs. If your GMB address uses the abbreviation “St.” instead of “Street” then stick to this with all of your addresses across the web. Your business name, address and phone numbers (NAP) need to be 100% consistent everywhere. If your firm has multiple business locations, you’ll want a separate page for each address with the location name in the URL and relevant NAP info. 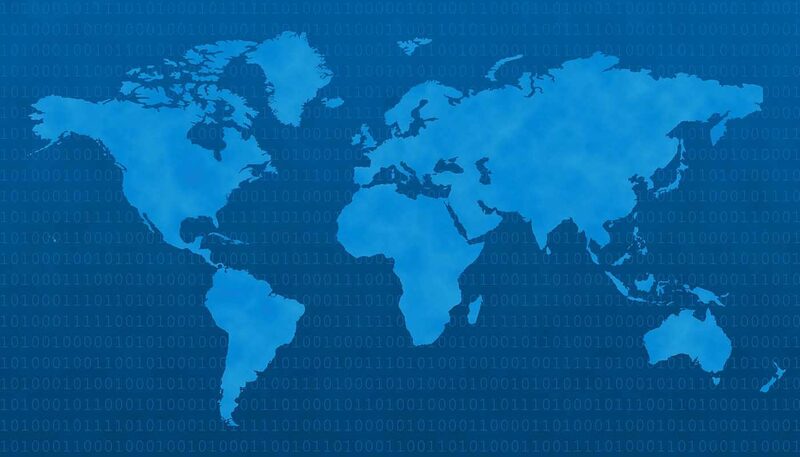 You’ll need to link these location pages from each of the locations you set up in GMB. If you only have the one location, you simply link to your homepage. We haven’t got time to go through all the technical steps in local SEO today and many of them overlap with traditional SEO. If you want a more in-depth explanation, reach out to us on social media or fill out the form at the bottom of this page. There are two key off-site SEO essentials for getting yourself in Google Maps: customer reviews and directory listing on third-party sites. The key with directory listings is to stick to the reputable names like Yelp and, once again, make sure your NAP info is 100% consistent with your GMP account and website. As for client reviews, Google Reviews are obviously important – not only for showing up in Google Maps but encouraging users to click your listing. In addition to Google Reviews, you’ll want to earn as many reviews on sites like Trustpilot and other Google partners. Aside from helping your cause on Google Maps, getting enough customer reviews qualifies you for Seller Ratings in AdWords – one of the most powerful ways to boost your CTAs from search ads. Of course, you have to make sure your services warrant five-star reviews from your clients to begin with. Even if their case doesn’t turn out the way they hope, they need to go away feeling you did everything you could to get the best result for them. You might also need to be a little tactful about when you choose to ask for feedback from your clients. Each year Google is getting more strict about businesses following its GMB guidelines. We’ve already seen some algorithm updates that have wiped businesses off Google Maps and we expect this to continue. So make sure you follow these guidelines carefully. What you might find is that some of your competitors don’t follow these guidelines and end up ranking higher than you because of it. Don’t fall into the trap of copying them and breaking Google guidelines. Instead, report them to the Google My Business Community under the Spam & Policy section and Google will review their account. Need helping appearing in Google Maps?